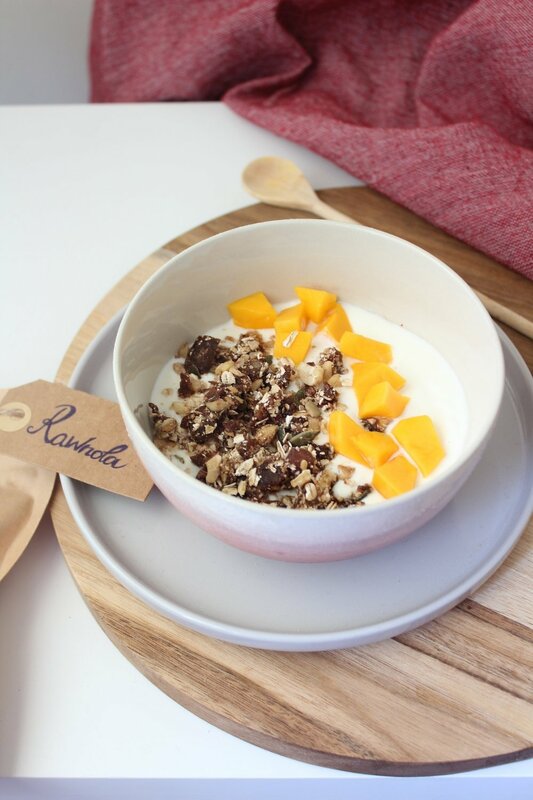 Rawnola is simply the contraction of raw and granola ! The idea is to combine oats and a couple of toppings with a binding ingredients, like dates, in a food processor to make then stick altogether but then cutting on the oven time and eating the granola as it is…raw ! The texture of rawnola quite different that the granola’s one. The texture is rather chewy than crunchy. For serving, the rawnola can be enjoyed on top of some yogurt or with your favourite milk and add some fresh fruits as well. This recipe is what you make of it, as always, use your favourite ingredients to make this recipe yours. Oats and dates make the base of this recipe. The rest is on you. Every ingredients will add texture, flavour, some extra goodness and nutritional value to the recipe. I choose flaxseed, cashew nuts, cacao nibs and pumpkin seeds for texture and to add nutritional value to the recipe. Then I add cinnamon, salt, maple syrup and cacao powder to add extra some extra flavours. You could also use shredded coconut, almonds, dried fruits, honey instead of dates, popped quinoa… the possibilities are endless. I hope you enjoyed this recipe and will try it for yourself !